ComQi is applying tools from its shopper engagement platform to the game-day experience for fans and operators of sports and event centers around the globe. Working with partners like Toshiba and iConnect, ComQi is lighting up arenas, stadiums, performing arts and convention centers with digital signage systems that include features like dynamic live video switching, total arena takeovers, and interactive info-stations. Sports and event centers driving the fan experience through ComQi's EnGage Content Management System include the famed Staples Center in Los Angeles and Helsinki's Hartwall arena, the top multi-purpose arena in Finland. "ComQi has built up a lot of experience servicing the sports and entertainment industry," explains Ifti Ifhar, CEO of ComQi. "We've seen entertainment venues shifting to become fan engagement environments, and the platform we provide to major retailers works just as well here in delivering networks with multi-channel touch points." - Driving large-scale spectaculars such as video walls and LED signage inside and outside event centers. 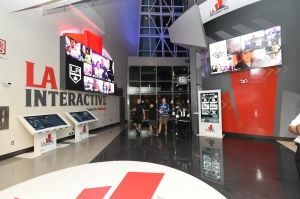 A showcase of interactive digital signage in the Staples Center. The home of the LA Kings, Clippers and Lakers, as well as iconic events like the Grammy Awards, uses ComQi dynamic digital signage that blends HD video, interactive messaging, data-driven content and social media visualizations. Toshiba America Business Solutions provides the Staples Center with Experience Manager, a branded version of EnGage, to show advanced interactive displays and content, including a 12-foot by eight foot LED video wall, several Ultra HD video walls, and 65" Ultra HD LED displays over the bar area. Game day fans engage with brands through social media platforms like Twitter, via curated posts and hashtag polls. They also view live game updates and video, player stats and league scores. Switched on in Nov. 2014, the platform also uses video analytics software to log and characterize audience patterns and demographics, and then markets content to match material to the fan base. For example, if face pattern detection reveals higher 18-35 female counts than expected at a Kings' game, marketers can tweak the ad and promotional mix accordingly to optimize the media opportunity. Some of the 240 displays now in Hartwall Arena. The Hartwall Arena went through a modernization program that included 240 displays located around the facility, all intended to raise the fan experience. Managed by ComQi partner iConnect, the system uses the EnGage platform along with 60 ComQi media players to drive all the displays, which include several video walls, screens located in the bars, walkways and hospitality suites. The content features promotions for upcoming events, food and beverage offers, and live footage streamed to all screens direct from the arena's broadcast studios.